Mary Queen of Scots and Elizabeth I shared a profound bond as cousins, queens, and women vying for supremacy in a man’s world—but eventually it became impossible for them to coexist. Kate Williams charts Mary and Elizabeth’s doomed relationship in an extraordinary historical narrative. With the desperate struggle between Protestants and Catholics as a backdrop, Williams transports us to a world of royal rivalry where violence and betrayal were the order of the day. Through it all, Mary and Elizabeth remained friends and allies—until the final act that led Elizabeth to order her cousin’s execution. 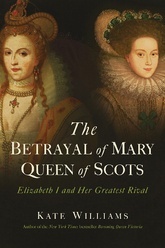 The Betrayal of Mary Queen of Scots portrays an extraordinary relationship as it recounts an epic era in English and Scottish history.